We offer wide range of Banner Display Stand. 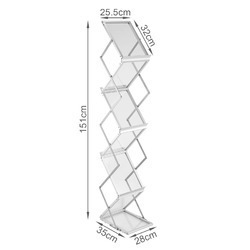 This Zigzag Display Stand is a great way to display your literature at trade shows. Its unique look captures the attention of anyone walking by your booth. With 6 pockets (3 on each side) it has plenty of room for your displaying options. Constructed of powder-coated metal, this is a very durable pop-up literature rack. The hollow holes design cuts out unnecessary weight while giving you an attractive look. Pop-up mechanism makes set-up a breeze; only takes a few seconds for the unit to be fully assembled Arrive at a trade show and be the first to display your literature in no time. With its fast assembly time and lightweight design, this convenient stand can go anywhere with you. Included is a traveling case so you can easily take the stand with you on the go. Pocket Size: 12" X 9" X 1"
Looking for Banner Display Stand ?